Access to bikes, together with safer places to ride, continues to expand in Pittsburgh with the expansion of the city’s Healthy Ride Program to include free 15-minute bike share trips for public transit users, and new and expanded designated lanes across the city. Bus and light rail users holding a Port Authority of Allegheny County ConnectCard now have access to unlimited 15-minute bike-share trips at no cost, and without the need for a credit card. The Port Authority, together with Pittsburgh bike-share operator Healthy Ride, have partnered to expand community access to bikes not only for recreation, but also to provide residents with connections that help them move between transit stops, home and work. 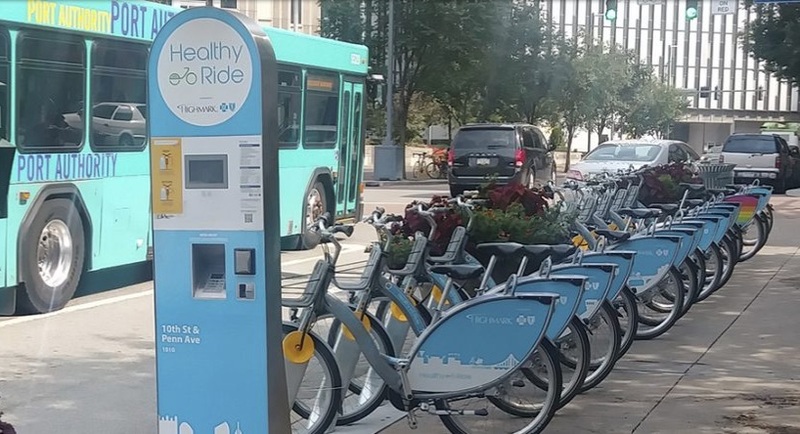 Anyone holding a ConnectCard, an RFID-enabled transit fare card, can access bikes at any of 51 Healthy Rides bike share kiosks located throughout the city. When accessing a bike the first time, riders simply tap their Connect card, then type in their phone number and a PIN texted to their phone. The system links their ConnectCard to their information so that no further input is needed during subsequent bike-share trips. Bikes are available 24/7, and can be returned at any Healthy Ride kiosk. The city continues to grow its network of designated bike lanes, including recent lane additions in the city’s East End. For more information on programs, initiatives and upcoming events, visit the Sustainable Pittsburgh website. Click Here to sign up for regular updates. Like them on Facebook, Follow them on Twitter. Click Here to support their work. To learn more about green innovation in the Pittsburgh Region, visit the Pittsburgh Green Story website.